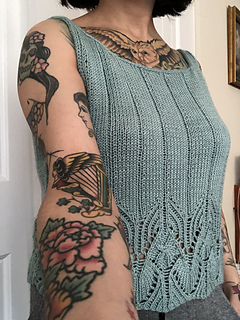 If you purchased the original version previously, please check your Ravelry pattern updates/the email used to purchase! Lydia 2.0 is a separate listing/download, and there is a lot of information laid out for you there along with a coupon code to use at checkout. THANK YOU SO MUCH! If you have any questions, let me know. Lydia 2.0 is a newly graded (and revamped!) version of my Lydia tank. 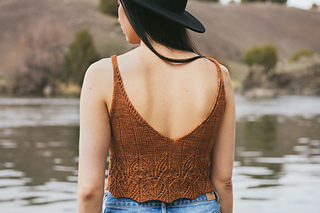 It features a beautiful tubular cast on, fun lace pattern at the bottom, with a cropped fit and a low v-neckline in the back. Perfect for summer, but great for layering in any occasion! 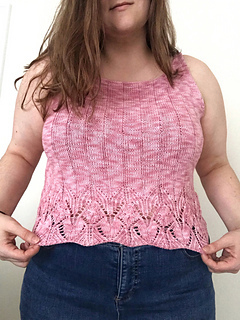 Whether you prefer working flat and seaming or working in the round/reading lace charts or written instructions, this pattern has got you covered. So much love and time has gone into improving upon the original, and I truly hope you will enjoy making, wearing, and loving your new Lydia! Check out the tester projects for more yarn/fiber/color inspiration! 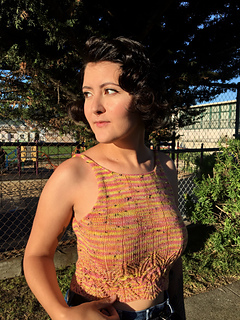 Complete written instructions on how to knit Lydia 2.0 in 14 different sizes, including both seamed and seamless versions. Lots of options to fit your preference as well as opportunities to learn new techniques! This pattern is written for 14 sizes, ranging from 27-66 in/68.5-167.5 cm finished bust/waist. A majority of testers found that choosing a size with little to no ease/up to 3-4” negative ease) yielded the best fit. I would recommend at most about 2” positive ease. The original sample shows no ease at the bust and 3” positive ease at the waist. Lydia is designed to have a slightly cropped fit, but is easily customizable to fit your preference! 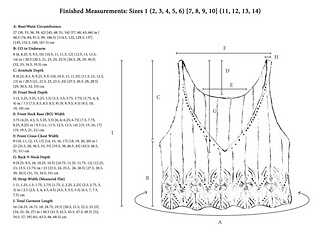 Schematic with measurements included in the Ravelry images section and pattern. 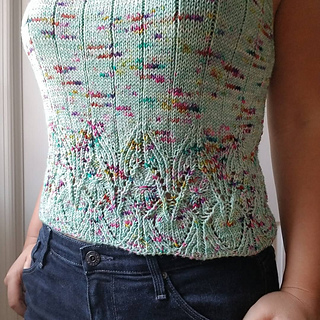 All measurements are approximate and taken after blocking. Inches are rounded to the nearest 0.25 in and centimeters to the nearest 0.5 cm.